This post is a review of Canadian ShareOwner Investments Discount Brokerage, otherwise known as “Share Owner”. I’ll be looking at the costs and comparing various scenarios with the cheapest Canadian discount brokerage Questrade. Canadian ShareOwner Investments is a different type of discount broker. It is the only broker that allows you to set up regular purchase plans for stocks and allows you to buy fractional shares. It promotes regular investing on it’s website, which sounds like a good idea, but I’m not so sure that regular contributions and stocks should go together. ShareOwner started in the 80’s, and at that time were fairly ground-breaking since they were a very cheap option for buying stocks. ShareOwner has a limited pre-selected list of stocks and ETFs you can buy – they are mostly Canadian and US dividend stocks and some ETFs as well. One of the big advantages of ShareOwner is the fact that you can automate your purchases. For example, maybe you would like to buy $250 per month of a certain stock? With ShareOwner, you can set that up quite easily. However, when I took a look at the overall fee schedule, I was less than impressed. The trading costs are $9.95 per trade which is no bargain. At Questrade, the trade would be $4.95. There is a limit of $40 per “order” so if you do a purchase of 9 stocks or more then it would be cheaper than Questrade. Account administration costs were high as well. The non-registered account doesn’t have an annual fee which is good, but all the other account types have high fees. $79 for RRSP, $100 for RIF or LIF accounts. RESPs are not offered. Questrade on the other hand, has no annual admin fees. The fee which I thought was most unusual was the “account withdrawal fee“. This is a fee charged if you want to remove money from the account. It is $12 for a non-registered account, a whopping $48 for a RRSP account and $100 for a home buyers withdrawal! I’ve never heard of any other brokerage charging a fee for account withdrawal. This fee is charged on top of trading fees so if you sell some stock in a non-registered account and want to withdraw the money, the trading fee will be $9.95 and the withdrawal fee will be $12 for a total of $21.95. The same action would cost $4.95 at Questrade. Let’s take a look at some scenarios and see which brokerage is better. Keep in mind that these scenarios assume you want to do monthly purchases in several securities which is not the cheapest way to buy stocks. A future post will go over some cheaper strategies. Investor wants to invest $350 each month, spread out into three different stocks. Questrade total fees for one year would be 3 x $4.95 x 12 = $178.20 which represents 4.2% fees on the purchases. ShareOwner total fees for one year would be 3 * $9.95 * 12 = $358.20 for an open account which is 8.5% of the purchase price. 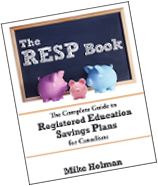 For an rrsp account the total charge would be $437.20 which is 10.4% of the total purchase amount. Please note that both these percentages are excessive – buying stocks on a regular basis is not a cost-effective strategy, unless you are buying large amounts ie $1,000 per stock per transaction. Read Low cost ways to buy dividend stocks. Also note that using this method of purchase, you would need to have $17,820 in the Questrade account to get the total fees down to 1% of the assets. In the open ShareOwner account you would need almost $36,000 in assets to bring the total fee down to 1%. Investor wants to invest $350 each month, spread out into 12 different stocks. Questrade total fees for one year would be 12 x $4.95 x 12 = $712.80, which represents 17% fees on the purchases. ShareOwner total fees for one year would be $40 (max) * 12 = $480.00 for an open account, which is 11.4% of the purchase price. For an rrsp account the total charge would be $559.00 which is 13.34% of the total purchase amount. Clearly, the advantage ShareOwner has is the $40 maximum commission. If you buy 9 or more stocks at a time, then ShareOwner will be cheaper than Questrade. Automated transactions which aren’t available anywhere else. Trading costs are reasonable, especially compared to big banks. “Philosophy of investing” – they do some stock selection for you. Limited selection of securities. If you want the big dividend players, however then you should be able to find what you want. RRSP annual administration fee is $79. Even the big banks charge less than this. TFSA annual fee is $50 and RIF/LIF annual fee is $100. This is not competitive at all. Account withdrawal fees are $12 for open account, $48 for RSP, $25 for TFSA. Home buyer withdrawal is $100!??? The purchase automation might be convenient, but I think if you are buying shares in individual companies that you should be more hands on. If you really want a minimum effort investment plan, then do a couch potato portfolio using TD e-funds. ShareOwner is fairly unique broker that comes with it’s own investing philosophy and education if you wish to use it. The trading fees are ok, but account admin fees and withdrawal fees are excessive. I really don’t like how they promote regular purchases and then charge $10/purchase. This is not a good way to invest. Read: Cost effective methods for dividend stock investing. If you are only looking to do the occasional purchase and no withdrawals in a non-registered account, then ShareOwner is not a bad choice. Otherwise, shop around. You forgot a couple of scenarios where shareowner is incredibly cheap. Think doing quarterly, twice a year, or yearly rebalances of a few stocks from their selection. That’s how I planned on using it when I first opened my account there, but as it turned out we decided to buy a house so I haven’t used it much. My main plan was to set up an automatic withdrawal from my regular banking account and then a couple of times a year pick a bucket of good dividend yielding stocks from their list. After that if I got enough funds together I could either transfer the funds to a more traditional discount broker or whatever I needed. In between that time the TFSA came out, and my new strategy was going to be to keep interest in a TFSA, interest and foreign dividends in my RRSP, and canadian eligible dividends with shareowner. Too bad I’ve never had the funds to really get things ramped up, maybe someday though. As long as you know what you’re getting and how to use it I think shareowner is a great option for someone like me that will only be doing a few transactions a year and want to keep costs down. Hey Traciatim – thanks for the great comment. I didn’t forget the occasional purchase scenario – in my conclusion I said that ShareOwner was a reasonable choice if you only do the occasional trade. But only for a non-registered account – the annual fees are too high for the rrsp account. It’s still not as cheap as Questrade, unless you buy a whole pile of stocks all at once, which you were planning to do. I had an account with ShareOwner and have actually switched to Questrade. Another Con not mentioned is that with ShareOwner, if you want to receive their “cheap” $9.95 commission then you had to put in your order and wait until the next time they purchased that particular stock. Sometimes up to 4 weeks! 4 weeks! So you effectively had no control over the price you paid for the stock. For about $20/trade you could put in a market order that would get filled immediately though. Limit orders didn’t exist in their world. Thanks for the info, Joseph. I knew about their “bulk” purchases method, but I had assumed you might have to wait a couple days at most. 4 weeks! That’s crazy. I had no idea that you could put in a market order with SO. But for $20 per trade, why would you want to? Interesting comparison but whenever I see someone claim that Questrade trades are $4.95 I know they have never had an account there. Out of 111 trades I have made with Questrade, 7, yes that is 7, were at $4.95. The rest ranged from $5 to $25.55 and we are not taking huge dollars or volumes. With 94% of the trades at $4.95, it is obvious that their misleading advertising is working. Simon, I’m aware of the liquidity charges, but never found them very significant. I just looked at the transaction costs for the last batch of trades I did in November. The total of all the trades was about $50k. Joseph, it’s not a con, it’s explained very clearly on all their material that they are a co-op trading company and they are designed for people who just want to do automated trading, or batch buys of stocks they offer. It is not advertised or intended to be a full discount broker. It’s not for day traders, market timers, technical traders . . . it’s for the people who are at work drinking their coffee thinking . . . “Hmmm, maybe I should buy some tim’s stock since I drink so much of this addictive goo”. It’s a nice easy way to introduce yourself to investing, and then transfer out to something when you get more experienced. Also, their schedule for purchases is displayed on their pre-screened securities list. For example XIE, MSFT, BMO, and RY and many other listings are all weekly, but CM, BRK-B, SLF, AAPL are once a month. A great way to use ShareOwner is to take 20 companies you like that they offer each January and do a bulk purchase of 5 grand split (or whatever you’ve put away) between those 20 . . . then repeat next year. You don’t have to worry about how much money goes in to eah one because they let you buy fraction shares so it’s just a nice easy 250 bucks to each in this case. Your total cost, 40 bucks (0.8%). If you did that at quest trade it would be $99 minimum. Plus Shareowner would auto-DRIP all year. If you don’t want to use it like that because you want more control over your holdings and transactions than the product isn’t for you. Like any tool it has it’s uses. I signed up with ShareOwner last fall when I was totally new to investing. After about a month I got frustrated and opened an account with Questrade. Three months later I moved everything out of ShareOwner and into Questrade! My TFSA and RRSP accounts in Questrade cost nothing. I can have US funds in my RRSP at no extra charge. My trading fees have always been exactly $4.95, with a varying network fee of around 19 cents tacked on sometimes but not always. I believe ShareOwner was a good deal when there was no other alternative to expensive full-service brokers. Now they are out of the running compared to discount brokers like Questrade. The big problem with ShareOwner isn’t the fees, it’s the timetable, the tortoise-in-molasses slowness in getting anything done. Even when I thought I’d set up a scheduled trade, it didn’t happen till a month later (meaning 6 weeks after I set up the trade! ), just because their administration is so poky. You don’t have to be a daytrader to want to pay attention to the news. I’m a buy-and-holder. But at different points I’ve pulled quickly out of a position just at the beginning of a substantial drop (think MFC, HBM, SC), taking profits that would have vanished if I’d been on ShareOwner. And sometimes on Questrade I magically get a better price than the limit I set. I love it! I think Canadian Shareowner is a good way for new investors to start. I used their software and followed its advise. It worked for me. I liked it the way it was some 10 years ago, less selection of dividend producing companies and no ETF’s. It kept me on a short leash with a selection of their top choices. The timing (luck) work in my favour me. I sold everything 3 years ago providing me with a 28% return since opening the account. Reinvesting those fractional share at no cost was big. Then I bought the house, its up 23%. Like I said, luck. I use Shareowner because of the Free Dividend re-investments. Investing fees are high, but if you can invest larger amounts and don’t trade that often, (investing only in Cdn Dividend Growth stocks) Shareowners is a good deal. Is Shareowner the only broker that doesn’t charge for the automated DRIP? Rusty, I don’t know of any broker that charges for the drip. The big difference (and advantage) with ShareOwner is that they will buy partial shares in the DRIP which isn’t normally the case. I am investigating everything (or most everything) re both Shareowner and Questrade. I will probably have accounts in both plus some direct DRIPs. What I like about Shareowner is the ability to start by buying partial shares in some really expensive stocks (e.g. Berkshire, Google, Apple) and have a partial share DRIP activated. What I really don’t like is their rate of exchange on US/CDN currencies. It’s what they call “prime” plus 1.5%…that’s higher than most banks. What I like about Questrade is their trading cost, no fee TFSA, being able to hold both US$ and CD$ in same acct. Looks like I have to really re-think using Shareowner 🙁 and maybe get 1 share of the stocks I want. @Anne-Marie It’s a pain having two different brokerage accounts. I’d pick the one that best suits your needs. one big problem with Shareowner is when you want to get out. You can transfer out whole shares to a brokerage and the brokerage will cover the fees. But, you have to leave the partial shares at Shareowner or pay an exhorbitant fee to sell them. I have invested with Shareowner on a couple of occasions and have to agree with a lot of the comments pro or con. My main problems were with the agonizingly slow response when trading in or out (waitng 4 weeks for a trade to take place is not acceptable) and the $12 fee for writing me a cheque rubs me the wrong way. Must check out Questrade to see if it will work better for me. You don’t have to re-invest your dividends. You can cancel those very easily online where you enter your trades and let the cash accumulate if you want.